To compete in a music streaming market, it’s no longer enough to give users access to what they want. Thirty years ago, if a person told you that you could have nearly boundless access to a world of music basically for free, you’d first. And that person’s sanity. This is how the music streaming industry works today — by shepherding the masses onto the path of least resistance and siphoning ads into their ears to pay for millions of tracks’ worth of royalties. It’s a model that places music squarely into “consumer goods” rather than full-fledged investments, as they were decades back. And with recent developments in how some services handle ads, it’s difficult to even imagine why you’d go back to buying music. So where do services actually compete, if all we want is something that’s free and easy to latch onto? Pandora was the service from which all my streaming infidelity began. It wasn’t an on-demand service where I could play exactly what I wanted, but I was sure I didn’t need one; anything I’d thumb up on a station was downloaded through other means. Entropy reigned supreme, and that was how I liked it. Until Spotify finally came out of Europe in 2011, that is. Something changed. Perhaps it was the novelty of having everything under your thumb without the heft of shelling out $10 every time you wanted an album or $0.99 for that orphaned single, the unbundling of which proved disastrous for music sellers. Or maybe it was the relief of not having to scour the back alleyways of torrent sites or crawling search engines; not having to obsessively download and retag music brought me over the edge. Spotify invaded my headphones for two years until the novelty wore off and I decided I wanted something vastly different. I wanted my music collection to talk back at me. Apple released iTunes Radio just a year ago to little fanfare — it was adding too little to a crowded market. Recently, they also acquired Beats Music for $3 billion. There were concerns, of course, of Apple once again trying to capture the crop of a market and only getting scraps. That wasn’t the case. iTunes Radio is now the third most popular streaming radio service, under Spotify and iHeartRadio, according to a report from Edison Research. Even if on the surface it seems like no one’s talking about iTunes Radio, really what Apple was doing was reining in yet another service to its ecosystem. Even if you don’t want it, it’s bundled on your Apple device. And it’s not just Apple, either. Google has Google Play Music, Microsoft courts its own niche with Xbox Music. Big tech is certainly giving this music race their all, but where does that leave third-party music streamers? The fact that YouTube was and continues to be a hub for people to latch onto free music and that streaming competitors like Rdio are joining the ad-backed model tells us that the competition is no longer in giving access. Aside from slight catalog differences, each streaming service essentially provides the same music. They need to do more than give access. They need to curate. They need to predict what consumers want, even if they don’t know they want it. And curation is something that lesser known services like Rdio, a streaming service that’s best described as a chimerical mix of Spotify and Pandora, have been providing as core features. They need to predict what consumers want, even if they don’t know they want it. What really solidifies the differences between Spotify and Rdio is that they run under the same backbone — a recommendation engine called The Echo Nest — and more or less the same catalog, but they build their services around two very different mantras. Rdio is for discovery. Spotify is for sharing. Jacks of all trades, master of one. While streaming services have, as a whole, tried to catch up with each other, usually the changes aren’t sweeping, nor do they get many announcements outside a single changelog mention. While that’s all well and good, perhaps they should take a second look in the mirror and assess where they can make the most of their resources. Do they want to bank on strengthening their core features to push out competition, or do they want to improve all their features and become the one-stop shop for music? Left: Spotify’s search results for artists puts the focus on content they’ve released recently. Tracks take the fore. Right: Rdio’s draconic album-oriented results, focused on popularity. While Spotify holds its reputation as a library and a free streaming service with the periodic ad, Rdio has been, from the start, a streaming service that capitalizes on tailored radio stations and album-oriented catalogs (as opposed to Pandora’s singles). Here’s what Rdio does that I haven’t seen replicated in any other streaming service I’ve tried. After listening to a playlist or album, it automatically plays music that’s similar in theme, vibe, etc, to what you played before. That’s enabled by default, and it usually gives you a mix of underplayed, under-appreciated artists. But these defining core features are largely being integrated into competitor apps. Take, for instance, iTunes Radio’s tuner. The left side of the tuner gives you more familiar artists, right side gives you some more adventurous choices. Very similar to Rdio’s own tuner, though it’s unclear which came first. Google Play’s own radio stations act very similarly to Rdio’s and it probably runs on Songza’s recommendations algorithms rather than The Echo Nest. 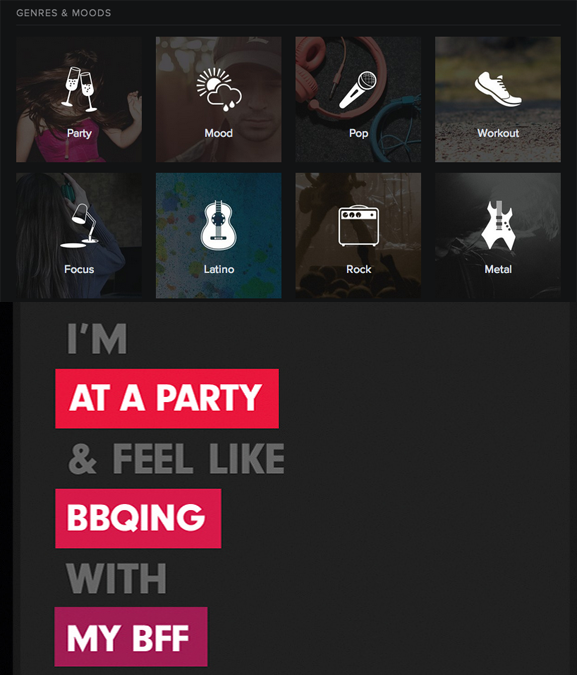 Going even further than just radio, services like Beats Music exist to address consumers’ gut feelings. Spotify had a very similar idea when it decided to give users a grid of moods. Maybe you don’t even know exactly what you want, what artist you want a radio station of. But you know you’re feeling some sort of way, so here’s something to listen to. Beats Music caters to an audience that may not know what’s good, but wants to hear something that’s as close to a life soundtrack as it gets. And that’s probably what Apple saw in Beats’ valuation. There’s no customer Apple exploits better than someone who doesn’t know what he wants, but just needs something that works. And Beats doesn’t even feel like it’s on the same playing field as the other giants. It doesn’t battle for access or exclusivity, content-wise. It addresses problems people thought didn’t exist. Thanks to Claire Giangravè and Megan Turchi.